Thousands of pottery sherds were found at the Itter Crescent and Fane Road Allotment excavations. We can recognise a variety of Roman pottery types – and because the fashions were always changing we can use pot sherds to help date other finds. Most of the pottery was made locally and included types known as greyware and Nene Valley colour coated ware. The Nene Valley pottery was dipped into coloured liquid clay (a slip) which when fired in a kiln turned brown, orange, green or black. 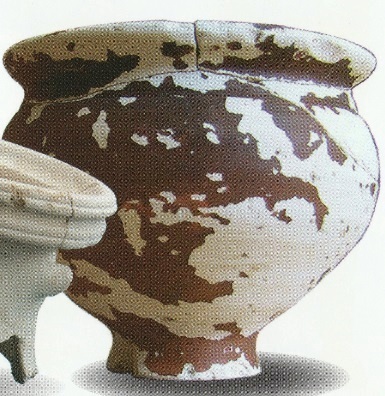 This pottery, which dates from the 2nd to 4th centuries included flagons, cups and beakers. It was widely distributed, having been found as far afield as Hadrian’s Wall and the south-west of England. 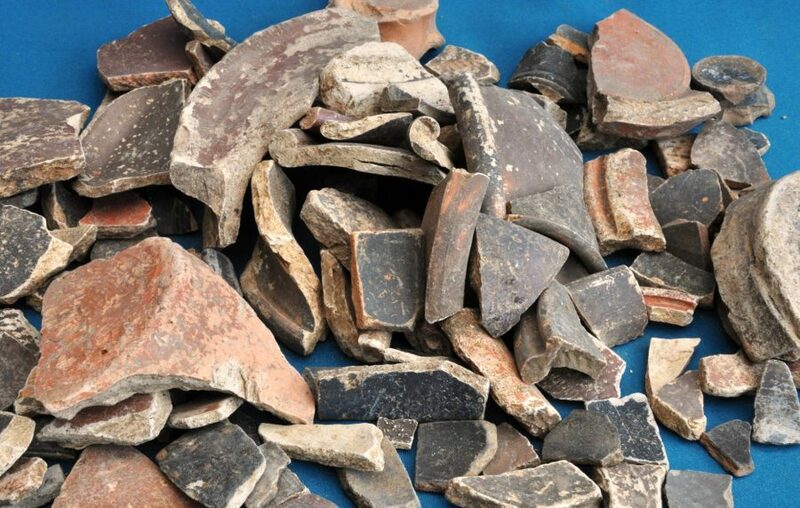 High quality imported pottery called Samian ware from Gaul (France) was also found along with fragments of glass vessels. The villa owners would use such table and glassware to impress their guests as they relaxed and entertained in the luxurious surroundings. 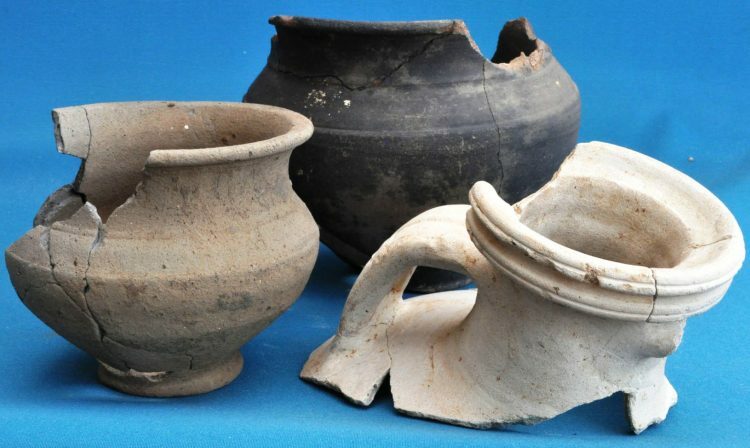 Parts of amphora used for transporting wine, olive oil and fish sauce were also found, showing that the villa residents would have enjoyed imported luxury goods. 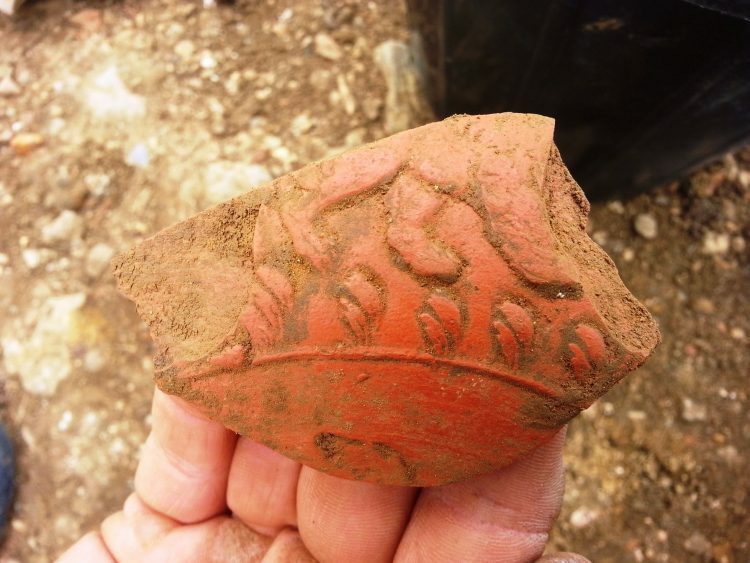 Roman Samian Ware showing the legs of a lion – fresh from the ground!